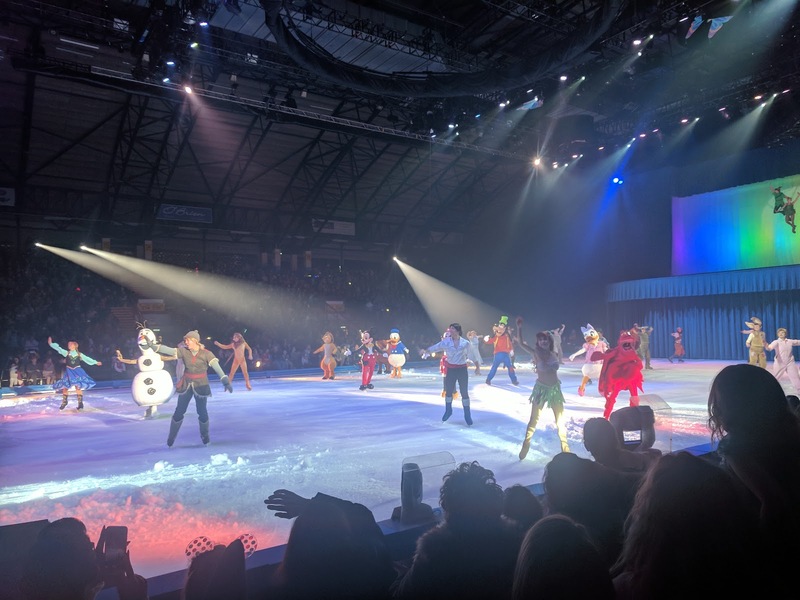 Last night we attended Disney On Ice presents Passport to Adventure and as I know a lot of you will be watching the show too, I thought it might be nice to share a few tips and give you an idea of what to expect. There are still a few tickets available online here if you fancy it. First of all, security at Newcastle Arena has increased a fair bit since last year's show. Expect to have your body scanned with a handheld scanner (it's non-invasive) and every bag will be searched. DO NOT BRING A RUCKSACK OR LARGE BAG to the arena as you'll be asked to leave these in your car, even a child's backpack. My small handbag was fine. You can read the arena's full safety policy here. The staff are absolutely lovely with children and there's nothing to worry about with the scans - I guess it's something we just have to get used to. Disney On Ice is obviously on ice so it can get chilly. Lots of children were dressed up in their Disney Princess dresses with a long sleeved t-shirt underneath and winter coat. I was rink-side and didn't find it too bad at all to be honest - I sat with bare legs and no coat and was fine. I do know that others said they felt the cold though so if you think you're likely to feel chilly, definitely bring your coat. 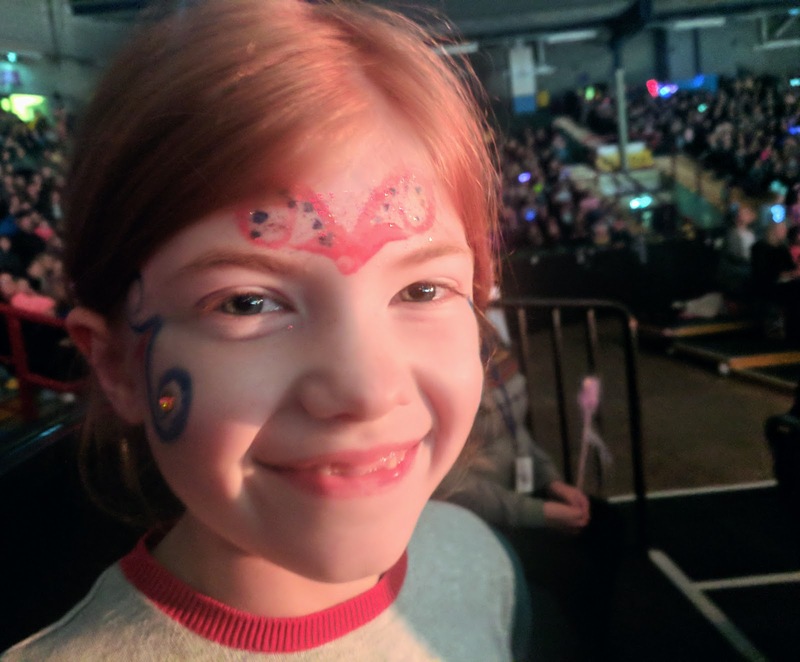 I love seeing children dressed up for Disney On Ice and even if it's just a Disney Tiara you have at the bottom of your dressing up box, painting their faces with a pirate patch and moustache or even a Disney tattoo, it always adds to the magic if you add a touch of Disney to your wardrobe. I spotted Ana and Elsa costumes for £4.99 in Home Bargains (Brockwell Cramlington) today. There's no denying that the merchandise on sale at Disney On Ice is some of the most expensive you'll find anywhere. 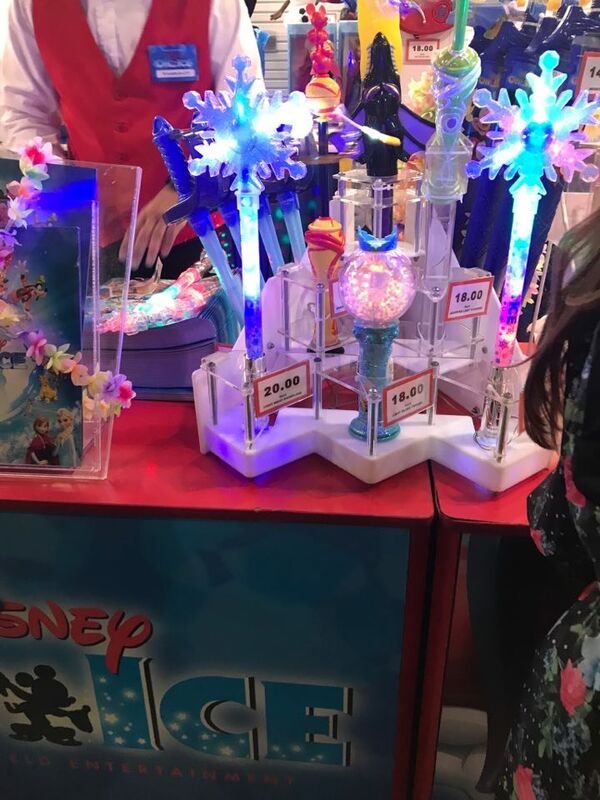 To give you an idea of what to expect, flashing Elsa wands are priced at £18 - £20, Ariel necklaces and shades were £10 and small figures £12. A Disney Princess Tiara is £10, fashing ears are £18 and soft toys are £12-£22. Popcorn is £8 in a re-usable Mickey Bag or £4 in a paper bag and snow cones/souvenir cups are priced at £9-£11. Huge thanks to Country Heart and Home for helping me to remember all of the prices! If you watched Nomipalony's Insta stories last night you'll know that she was repeatedly hit in the head with a flashing wand - if you buy these for your kids, make sure you keep an eye on them! I was honestly worried for Nyomi's beautiful hair and was half expecting it to end up tangled up in a wand by the end of the evening! 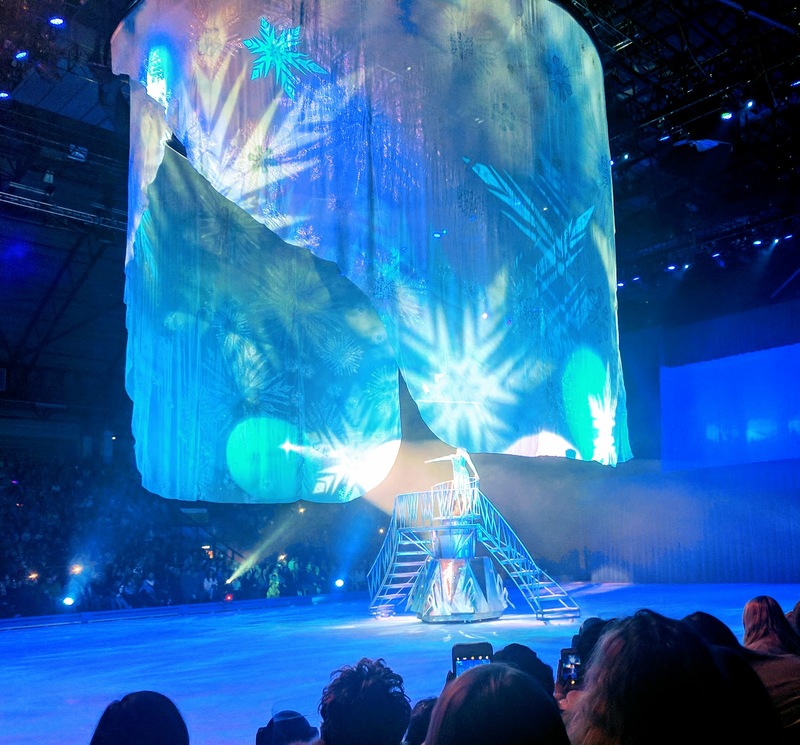 For me, this year's show is honestly the best Disney On Ice performance I've watched. The first half is dedicated to The Lion King and Peter Pan. I LOVE The Lion King and honestly could feel the love in the room as Nala and Simba beautifully skated around the ice. I did have to close my eyes at a few points though as Nala's head came within inches of the ice as she was swung around the air. My only disappointment from the whole show is that Scar didn't make an appearance - we love a good baddy in our house and really felt he was missing from the show. Peter Pan uses incredible staging with the whole arena being used - I won't ruin any surprises for you but the staging is fantastic. Nanna the dog, Tinkerbell and Smee provided lots of laughs and Heidi and Jack could not stop laughing at them. I LOVED that the crocodile made a couple of appearances too. There is a short 15 minute interval and the second half begins with The Little Mermaid - love, love, loved this as the ice was filled with so many of my favourite Disney characters. My favourite scene was when Ursula managed to skate around with Ariel as she captured her voice. 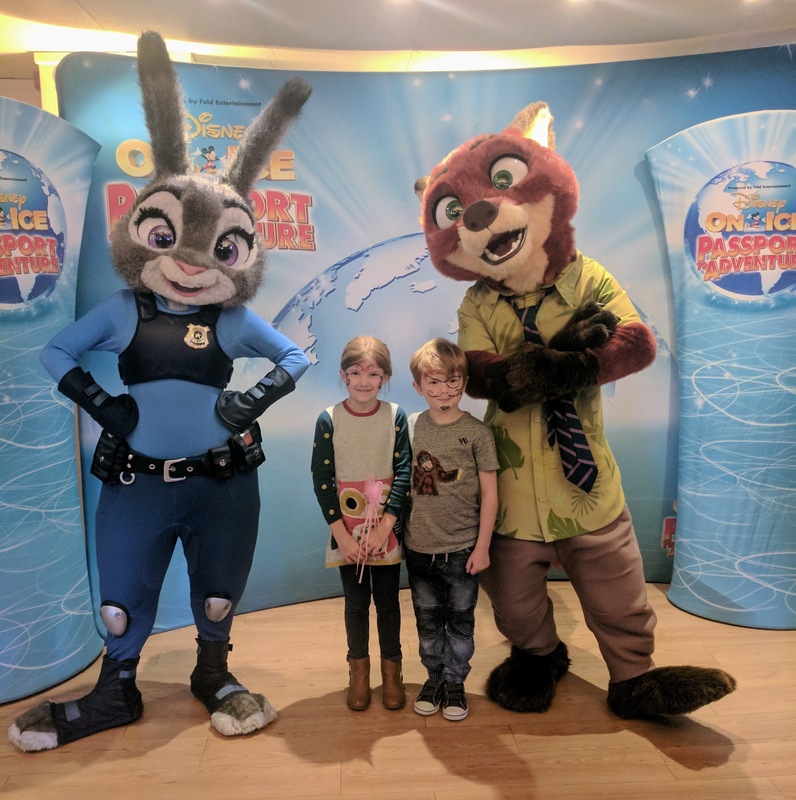 Heidi and Jack were also lucky enough to be invited onto the ice during 'Under the Sea'. This was a dream come true for them and they spent the whole evening beaming from ear to ear. Check out my video below (they're in the submarine). The big finale is Frozen and to be honest I thought I was all Frozen-ed out. However, as soon as Elsa and Ana start singing you can't help but get swept up in Frozen fever and the final scenes were when the arena really came alive. We all sang along to our favourite songs and I always love watching Elsa skate along to Let it Go - it's just so beautiful. I would recommend re-watching Peter Pan, The Lion King, Frozen and The Little Mermaid before the show if you have time so you can re-familiarise kids with the story. Steve picked us up from the road near the arena and this was nice and easy - we were on the road and home nice and quickly. I would strongly suggest you arrange to be picked up, use public transport to get home, book a taxi or park in a non-arena car park. 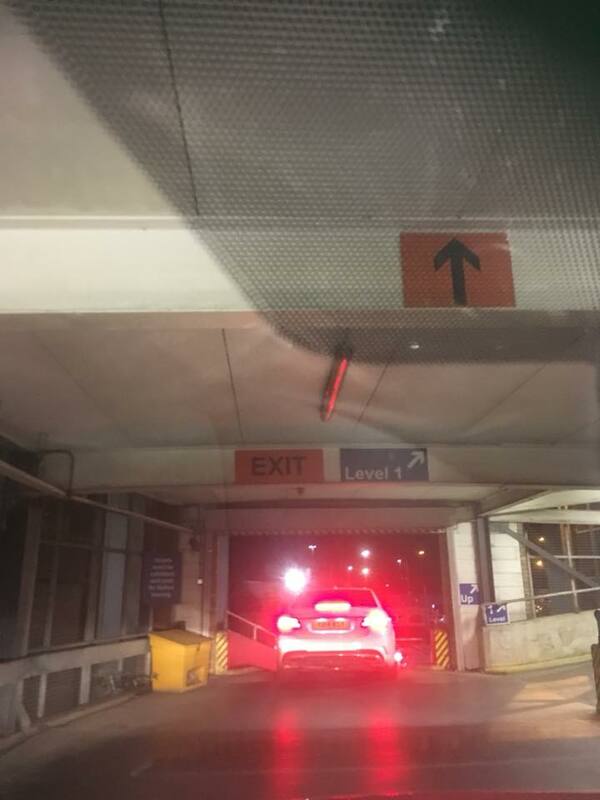 I really felt for the Hoopers as they were stuck in the multi-story car park trying to leave for over an hour. When they messaged me to say they were home, we had already eaten dinner and were almost ready to go to bed! You can still buy tickets to this year's Disney On Ice presents Passport to Adventure here. Everyone I have spoken to really enjoyed this year's show and I cannot recommend it enough for little ones - especially those aged 3-9 years, although saying that there was a 1 year old sitiing next to me who was absolutely captivated throughout. It's definitely a performance for the whole family. Thank you for the mention. Those wands are a hazard, the same happened last year too! I would say we parked in the Arena car park at the back, it was £6 but we got parked easily and got out easily. I think the Hoopers parked in a non arena one? I too feared for Nahla’s head, it was so close to the ice, I was wincing. Some brilliant Olympic style moves. Quick question as first time to disney on ice re baby bags??? What am I supposed to put nappies and wipes in?? ?